Posted Dec 27, 2017 by Eds. 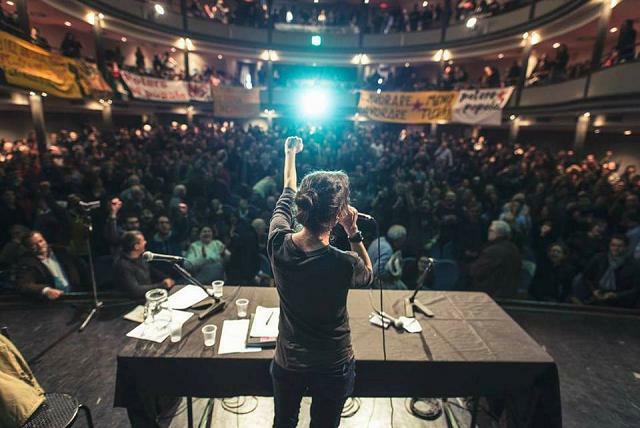 In Rome on December 17, the first national meeting of Potere al Popolo (Power to the People), a new grass-roots left-wing movement aiming at running for the next general elections in March. But the new group also aims at giving new lifeblood and a new perspective to Italy’s radical left. The meeting, attended by thousands of people, was thrilling and inspiring; all Italian communist parties and organisations, as well as environmentalist groups, social and community centres and workers associations took part in it. Moreover, many international guests were present at the meeting, including a Palestinian delegation, the Spanish Communist Party and Izquierda Unida (United Left), the Party of European Left and France Insoumise (the party of Jean-Luc Mélenchon). Plus, Mélenchon himself saluted the meeting with an enthusiastic official announcement on his website. The vital core of Power to the People does not lie in the power games of the older generation of politicians, but rather in the strength and enthusiasm of the new generations of workers, students and activists. That’s the reason why one of the core issues of Power to the People’s political agenda is to set up a long-term political project. The aim is not only to run for the next elections, but to allow the Italian people to permanently and actively become the main decision-making organ within Italy’s political life. This political movement, indeed, is based on the principles of social justice, solidarity and equality. Moreover, Power to the People is the only political group whose agenda openly and clearly includes the defence (and, in some cases, restoration) of the workers’ rights, which have been constantly attacked and reduced by the government. Power to the People also refuses to scapegoat migrants and refugees, calling for a more human and fair reception system. In particular, it firmly refuses to legitimise the current agreement on migration flows between Italy and Libya, under which, in order to prevent migrants to reach Europe, those attempting to migrate are jailed in Libyan detention centers and deprived of their human rights. Human and civil rights are a crucial point of Power to the People’s agenda: it also proposes to fight discrimination against LGBTQI community and to definitively legalise marriage equality. Furthermore, Power to the People aims at winning disarmament and peace, in compliance with the Italian Constitution, and making education free and accessible to everyone. Free education is part of the process of redistributing wealth and rejecting of austerity policies, which are fundamental principles of the new political movement. Power to the People’s first national meeting, Rome. As things stand now, Power to the People represents the only left-wing alternative in the Italian political scenario. That is, the Democratic Party (PD) has now entirely forgotten its communist past, endorsing completely the neoliberal policies of the European Union. By contrast, another new movement, called Free and Equal and led by the President of the Senate Pietro Grasso (a former member of the PD), cannot be considered a real left-wing party. It is the gathering of an old-fashioned political elite with neither bottom-up participation nor people’s involvement. Indeed, the founders of Free and Equal deliberately excluded every radical left, social and environmentalist group from their party. This clearly shows that their goal is not to give people a political voice, but to form a government alliance with the Democrats and other moderates after the elections — repeating the same old mistakes of the Italian centre-left. With the approach of general elections, Power to the People faces some challenging tasks. The key will be trying to win support from millennials voting for the first time, and the “non-voters” — i.e. those people who have lost faith in the old political class and don’t vote anymore. Power to the People is also the most effective and viable alternative to the rise of neo-fascism, which is jeopardising Italian and European democracy. Power to the People is the only way through which neo-fascism can be definitively defeated by significantly reinforcing democracy, and giving voice and political weight back to people. The real strength of the movement is the huge popular participation and the large number of activists, which means that it is possible to be optimistic. These activists are only interested in building a better future for Italy and Europe, without being blindly focused on their eventual political career. It is obvious that such an ambitious project, namely to reinstate equality and social justice in Italy, will take a long time, but the youthful enthusiasm of Power to the People bodes well for Italy, independently of the result of next elections.